Ancient Mesoamerica is the international forum for the method, theory, substance and interpretation of Mesoamerican archaeology, art history and ethnohistory. 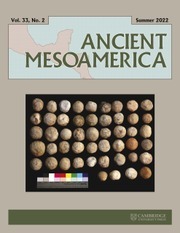 The journal publishes papers chiefly concerned with the Pre-Columbian archaeology of the Mesoamerican region, but also features articles from other disciplines including ethnohistory, historical archaeology and ethnoarchaeology. Topics covered include the origins of agriculture, the economic base of city states and empires, political organisation from the Formative through the Early Colonial periods, the development and function of early writing, and the use of iconography to reconstruct ancient religious beliefs and practices.